Hey it's Fri-yay and were here counting down the minutes until it's the weekend! And since it's already almost 4pm that means it's almost the weekend! 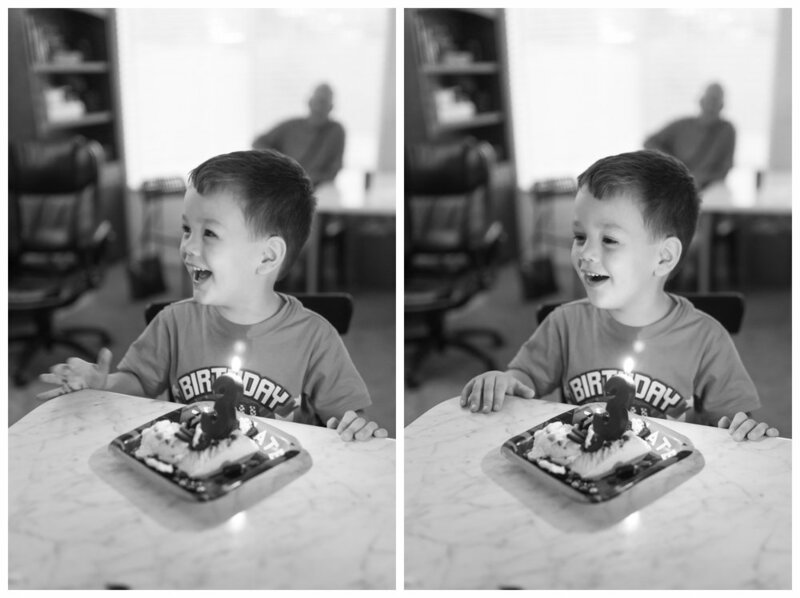 Last Saturday we celebrated our youngest son's birthday! Titus is now 3, yippee! We know everyone says this but where does the time go?? Three years old means we are finally, after 9 years, all out of diapers, cribs, diaper bags, and all things baby. We have given away all the baby stuff and we are mighty happy about that thank you very much! We had a little party with some of our friends and family, where we we all got run over by cars and trucks because...that's what three year old boys like ;). We also did something a little different and had an ice cream sundae bar instead of a cake. When you're allergic to life like Titus, then you have get creative! Everyone loved it and it saved me hours of stress and time... bonus! We are so proud of our little man, he is so funny, cracks us up all the time, and really is the perfect caboose to our crazy train. Happy Birthday Buddy! Yesterday was National Coffee day and we celebrated because...COFFEE. We got out the fancy cups, drank an extra cup for good measure, and got more work done then we did all week. Boom. Thank you coffee for existing and for being awesome. We love you...XOXO. On Monday we crossed another parenting milestone off the list. We got a phone call from Eli's principal. Yup, you read that right, the principal. Apparently he tried to be MacGyver and open his class room lock with a stick. Then it broke. In the lock. Thankfully, they were able to fix the lock and not much harm was done but it still earned him a visit and then we got the call. He ended up apologizing to his whole class and his principal was super sweet and encouraging but it was still a tough night. Obviously he still has a ways to go before he can defuse a nuclear bomb while tied to a chair with only a ballpoint pen and a pair of sunglasses. If we are being honest this week hasn't been the best. Parenting while trying to run a super fancy photography business is hard. Somedays we work all day and feel like we are taking two steps back. We question sending our kids to school (instead of homeschooling) and pray the whole way that we are making the right decision. The struggle is real when we are taking care of sick kids while we schedule client meetings. BUT... aren't you glad there is always a BUT... at the end of the day, or week in this case, what matters is that we are a family and we have each other. We are sticking together, praying and supporting one another, answering emails and taking turns tucking in kids when they get up...for the 14th time. We know we are serving our clients to the best of our abilities and making sure their needs and biggest wants are being met and that makes it all worth it. It's a crazy ride but it is seriously the best ride we've been on. We are creating something amazing and we know it will benefit everyone we have the honor of working with and that is worth every bad week. So heres to a weekend off with the kids, no school, no schedules, relaxing on the couch, eating cookies, drinking coffee, doing some location scouting and just enjoying one another. Because in the end, we are family and we're in this together.